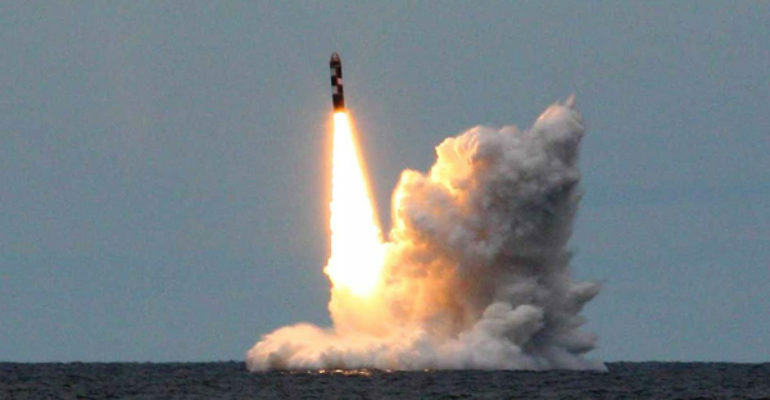 Russia’s 3M-14 Bulava ballistic missile is the submarine-launched variant of the SS-27 Topol-M. The Bulava, which represents the pinnacle of Russian ballistic missile technology, can hold 10 warheads with each warhead having a yield of approximately 550 kt. The Bulava’s range has been slightly reduced by 2,000 km from the land-based Topol-M variant due to its conversion from land-based to submarine-based. The missile also has many modern designs that allow for increased effectiveness of the missile. It reportedly has a GLONASS receiver giving it the accuracy of its land-based counterpart. The boost phase has an accelerated ascent as a countermeasure to protect against potential anti-missile systems. The missile can also come equipped with targeting decoys and is capable of evasive maneuvers during the terminal phase to avoid missile intercept. The 12.1 meter long missile is equipped to fit into the Borei class submarine which is the Russian fourth-generation submarine. The Russian Defense Ministry expects to have 12-16 Borei class submarines by 2020, all capable of carrying the Bulava missile. A converted Typhoon class submarine is also capable of carrying and launching the Bulava missile. The Bulava has the intercontinental-range of the Topol-M but with the maneuverability of a submarine launched ballistic missile. Russia has such high expectations for the Bulava missile that when Russia commissioned its first two Borei class Submarines, it refused to use the submarines without the Bulava. Furthermore, the Bulava program was Russia’s most expensive military program and along with the Borei class submarine, is expected to be part of the Russian nuclear triad until the 2040’s. While the Bulava missile possess serious strategic challenges to the United States and its allies around the world, it has faced numerous issues since it began development in the late 1990’s. Along with being the military’s most expensive weapons program, only five of the 12 test launches were considered successes with some military analysts saying even the successful launches had multiple flaws. The test failures along with delays in the Borei class submarine has left developers as well as the military frustrated, however, they claim that the program is worth the expense and frustration. As of 2013, the Bulava missile has been operational and the program is expected to continue to grow as Russia phases out its Soviet-era nuclear arsenal.